The entire ordeal usually lasts for months, especially if you're buying a whole room full of furniture, and it's one big exercise in frustration. This store has the right style sofa but the colors it comes in are all wrong; that website has a chair in a great fabric but the arms are weird; that console table would be perfect for your foyer - if it were about 14 inches shorter. Something's off with every piece - and what you do find often seems a little flimsy even if it's not the cheap stuff. So what are you supposed to do? Spend good money to settle for something that's not ideal, or just keep looking indefinitely in hopes the right pieces materialize at some point?!? Sure, you can find tons of furniture buying tips and tools out there that are supposed to help make the whole process easier. And while I'm all for measuring your space carefully and sitting on different types of cushions to see what you like, no shopping strategy or online room designing software can change that fact that what's available to the public through retail outlets just doesn't cut it for getting you what you want and need. "Trade" furniture is better than retail. Yep. I said it. The furniture itself is absolutely better in both quality and selection, but buying furniture that's sold only through the design trade offers the customer an infinitely better experience and service process. I know that might sound like meaningless marketing-speak, but hear me out. There are some major differences between retail and trade furnishings the buying public just doesn’t know about. For starters, we feel so limited with retail furniture options because we are limited by them. When you're dealing with mass-produced products of any kind, you basically get what you get in terms of styles, colors, details, sizes, etc. 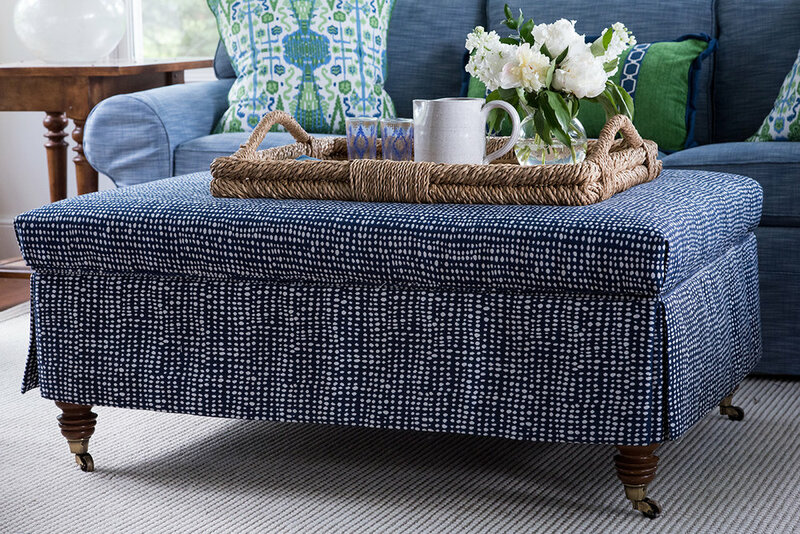 With the exception of a few additional fabrics and style choices that open up with new retail “custom” programs, your choices are set in stone long before you even know you’re in the market for new furniture. Which is exactly why designers shop "to the trade" furniture brands for their clients instead. There's just no way I could get my clients' homes to look as balanced and well designed as I do if I was limited to ready-made retail items. Getting a space to look right is a delicately balanced equation of scale, symmetry, color, style, texture, etc. Get any one aspect wrong and the whole thing looks off. If I'm limited to retail furniture options, I lose a lot of my control over that balance. Given enough time, I might be able to find good options and create a nice design, but my clients certainly don't want me to take a year or two on their projects. Nor do they want to potentially end up with subpar quality pieces that won't last very long anyway. Being able to customize pieces as needed to fit into the room's design equation and being assured that what I source for my clients is of great quality is invaluable. Let's break that down even more into exactly what's better with trade furnishings. This is huge, huge, huge! After all, what good is a beautiful chair that only comes in white or grey if you need blue? Or a sofa if the gorgeous fabric it's covered in is too delicate to survive your kids and pets for a few months, let alone 5-10 years? The best designs include a mix of different patterns and textures in the fabrics. Designers have entire libraries of fabrics for each manufacturer. Where you might have 5 options in a retail piece, you have literally hundreds for a trade piece, which means the likelihood of being able to create a killer combination is exponentially higher. And if the manufacturer doesn't have the ideal fabric, we can usually opt for "COM" - customer's own fabric. That means we can use any fabric we want (as long as it's suitable for upholstery). We just find out from the manufacturer how much we need, order it from a fabric supplier, and have it shipped straight to the factory for your piece to be covered in it once the frame is made. The same holds true for finishes on case goods - bookcases, tables, etc. - and seating legs. I know you've seen retail furniture before and thought, "Why on earth did they ruin that beautiful coffee table with that hideous stain color?" or "That chair would be great if the legs weren't painted white." While we don't have hundreds of options like fabrics, designers do have libraries of paint and stain finishes from each manufacturer. Those finish samples are usually sent to us as actual finished pieces of wood, not as sample cards, so we and our clients can see exactly what we're getting. Having more finish options open to me has saved so many designs for me over the years. Without the right stain or paint color choices, it’s back to the drawing board to find a totally different piece that does come in the right color. And good luck finding the right size and style from there! 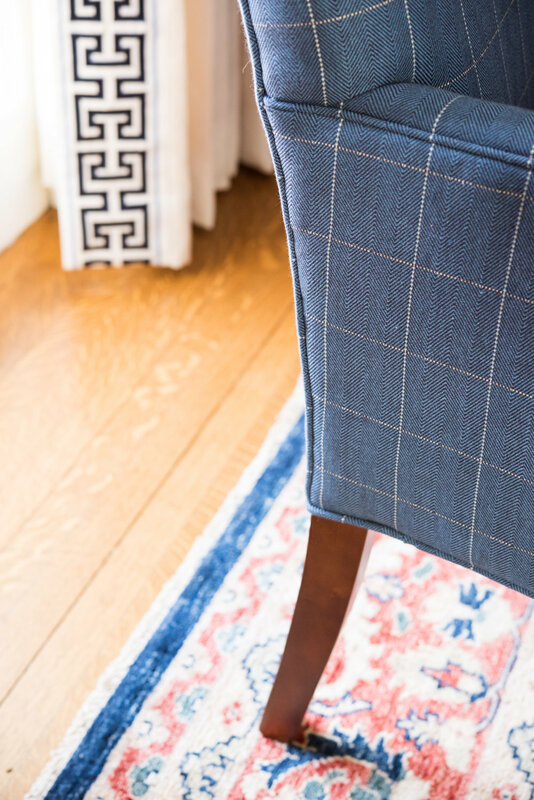 Beyond beautiful fabrics and finishes, the fine details on your furniture pieces can really make your entire space look more elevated and feel more luxurious and functional. Decorative trims, nailheads, contrasting piping, leg and arm styles, cushion fillings, soft close cabinets and drawers, etc. - these seem minor compared to the overall style and color of a piece. But these aspects actually make a very big impact on how your rooms look and feel in the end. 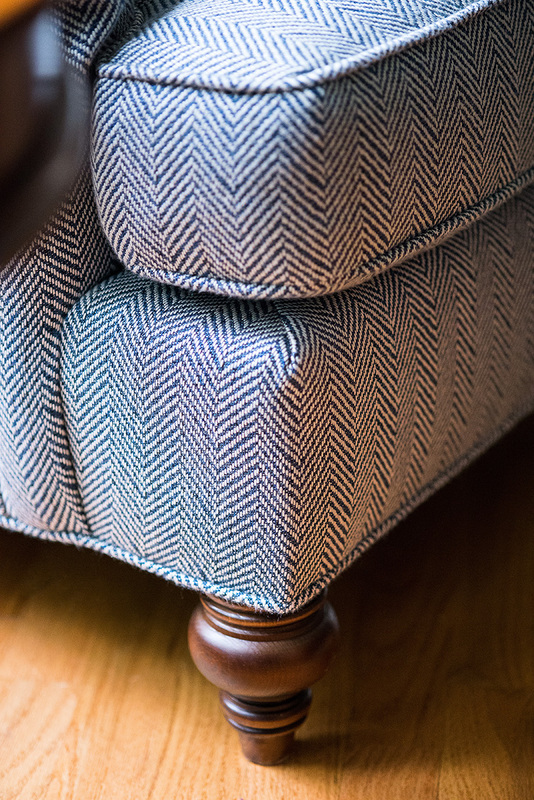 Instead of having to choose between the boring sofa that has ridiculously comfy cushions and the gorgeous sofa with rock hard cushions, trade pieces let us put together the right combinations of details to make your rooms amazing from top to bottom. Put simply, if your furniture isn't the right size and scale for your space, it will never look right, no matter how beautiful it is. When our furniture is too small, we find ourselves trying to fill in the gaps with more too-small pieces, but all we end up with is a cluttered mess. If it's too large, we lose valuable walkway space and our rooms look small. This is actually one of the hardest aspects of design to get right in general, let alone to find the actual pieces that work in the design in every other way, as well. We can't always adjust the size of pieces sold to the trade (sometimes we can get them to use taller or shorter legs, etc.) but we do have a much bigger selection to begin with. I'll start my search for the right size and overall style piece for a client. Once I land on that, I can customize the details and finish as needed. Even moderately priced furniture adds up when you need an entire room full. If you're going to invest, you definitely don't want to be replacing it all in a couple of years, which is why "throwaway" furniture isn't a bargain at any price (unless, of course, you happen to be a college student, in which case, you might happily use that broken down, sorry furniture until graduation!). Even if you don't really care about handing your furniture down through the generations to come, you still want to be sure it looks beautiful and functions well for at least 8-10 years for seating and even longer for case goods like tables and bookcases. That all adds up to a good argument for my one furniture buying tip to purchase trade furnishings, doesn’t it?! But there’s even more that makes trade furnishings better than retail. Come back for Part 2 and you’ll see what you get in addition to better options and higher quality when you skip retail and buy through a designer. In the meantime, you can make some actually fun plans instead of schlepping around town to every furniture store in sight!